Simple, safe and rapid commissioning. This innovative technology is the cornerstone of the success of the Rotork IQ electric actuator range and now offers the same comprehensive range of benefits to the users of Skilmatic actuators. Simple, safe and rapid commissioning is achieved using the Rotork hand-held setting tool and infra-red link. Actuator settings such as position limits, internal pressure and control and indication functions can be set and accessed without removing electrical covers, and any environment, day or night. 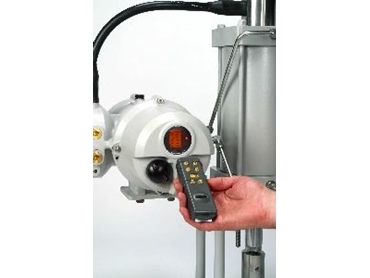 The actuator's easy to read illuminated LCD display provides valve position, control and alarm icons as well as giving access to comprehensive diagnostic information and help screens. The double-sealed electrical control module also enables connectivity to the Rotork Pakscan two-wire digital control system or Open fieldbus protocols such as Profibus, Modbus, DeviceNet and Foundation Fieldbus. The new Skilmatic intelligent actuators - designated SI range - continue to offer the traditional Skilmatic design strength of simple and flexible electrical operation combined with the precision of hydraulic positional control. Available for linear or quarter-turn valves, SI actuators are built to IP68/NEM6 watertight specifications with the option of ATEX and IEC explosion-proof certification and are suitable for single phase, three phase or 24V dc power supplies. Full details are available on the Rotork website (rotork.com) where document reference E711E can be viewed and downloaded.